The Atascosa River rages over the bridge at Hunt Street in Pleasanton after several inches of rain fell last week. 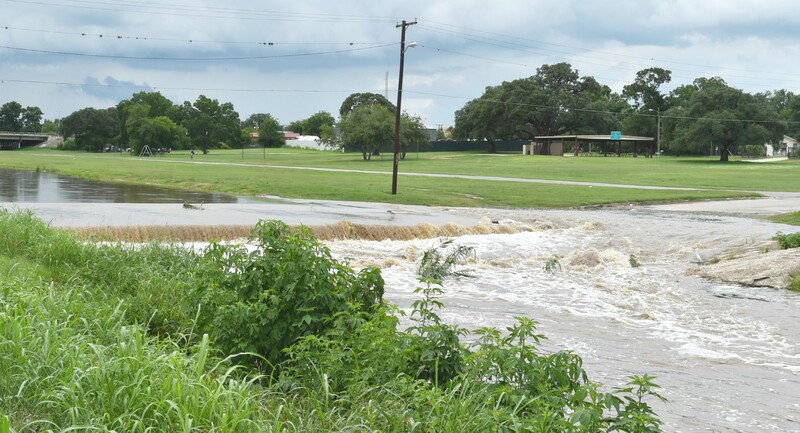 Recent rains have drenched Atascosa County as low-water crossings quickly disappeared after several storms over the past few weeks. According to Sherry Orsak with the Atascosa County Soil & Water Conservation District, 5.19 inches of rain was recorded in Pleasanton in May. The amount of rain led to flooding around the county and caused many roads to close in Pleasanton with Adams Street and Hunt Street bridge crossings shut down. On May 31, a total of 1.16 inches of rain fell in the county, along with 1.32 inches on June 2. Last May, a total of 12.04 inches fell in Pleasanton with a whopping total of 27.87 inches from January 1-May 31 of 2015. The 2016 rain total in Pleasanton as of yesterday is 12.84 inches.